With the outbreak of World War II armies needed to become orally proficient in the languages of their allies and enemies as quickly as possible. This teaching technique was initially called the Army Method, and was the first to be based on linguistic theory and behavioral psychology. Based on Skinner’s Behaviorism theory, it assumed that a human being can be trained using a system of reinforcement. Correct behaviour receives positive feedback, while errors receive negative feedback. This approach to learning is similar to the Direct Method, in that the lesson takes place entirely in the target language. Emphasis is on the acquisition of patterns in common everyday dialogue. 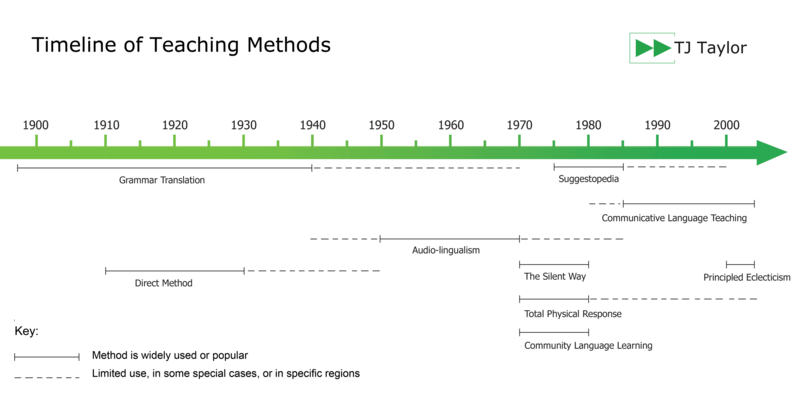 The Audio-lingual Method was widely used in the 1950s and 1960s, and the emphasis was not on the understanding of words, but rather on the acquisition of structures and patterns in common everyday dialogue. These patterns are elicited, repeated and tested until the responses given by the student in the foreign language are automatic. The Audio-lingual Method is still in use today, though normally as a part of individual lessons rather than as the foundation of the course. These types of lessons can be popular as they are relatively simple, from the teacher’s point of view, and the learner always knows what to expect. Some of the most famous supporters of this method were Giorgio Shenker, who promoted guided self learning with the Shenker method in Italy, and Robin Callan, who created the Callan method. This extensive memorization, repetition and over-learning of patterns was the key to the method’s success, as students could often see immediate results, but it was also its weakness. It was discovered that language was not acquired through a process of habit formation. The method’s insistence on repetition and memorization of standard phrases ignored the role of context and knowledge in language learning. As the study of linguistics developed, it was discovered that language was not acquired through a process of habit formation, and that errors were not necessarily bad. It was also claimed that the methodology did not deliver an improvement in communicative ability that lasted over the long term.